Mitsubishi Electric ventilation systems efficiently condition outside air to improve indoor air quality. Lossnay® Energy Recovery Ventilators (ERVs) use available energy in stale exhaust air to precondition incoming outside air, reducing the building’s HVAC energy usage. 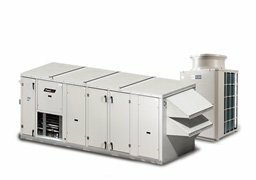 The PremiSys® DOAS family is designed to handle 100% outdoor air with optional energy recovery and is ideal for handling ventilation air in VRF applications.